You’ve probably had your Thanksgiving menu planned for a while now. You might even have it broken down into a schedule: Tuesday brine the turkey, Wednesday assemble the stuffing, etc. I’m here to ask you, what are you going to eat BEFORE Thanksgiving. I ask this because I think managing our time and energy gearing up for a big holiday event like this can set us up for happier holidays. I have made the mistake of trying to make something labor-intensive like lasagna the day before Thanksgiving and been sort of burnt out, not to mention the lack of fridge space when you’re storing leftover lasagna. Basically, you need to PLAN AHEAD. Plan to GIVE YOURSELF A BREAK before you are drowned in turkey and stuffing. A break from cooking, a break from washing dishes, a break from poultry, a chance to clean out the fridge in anticipation of what is coming. If that means sandwiches and fast food, that is totally fine, just take your tasks and schedule into consideration and PLAN it. For myself this year, I decided to try meal prep. Lastly, I want to add that I realized this prep would be easier/more delicious if I cooked potatoes in the pot with the roast for that meal and replaced the rice with black beans for the burrito bowls. If you love rice (or cauliflower rice) do that, but if I’d had my head on straight when I was planning this I would have done potatoes and beans, because I love both. Cauliflower rice is admittedly probably better for my health, but everyone’s different so do you. 1. Chop lettuce for salad, 2 onions for roast (chunky) and 1 for soup (proper dice). Then chop carrots: about 2-3 cups chunky for roast, 1 cup diced for soup, the rest into sticks for snacking. Wash your baby potatoes. 2. Salt and pepper your roast, sear it and put it in the crock of your instant pot or slow cooker. Add 1 cup of beef broth, the chunky onions, carrots, and baby potatoes, and cook at high pressure for 1 hour or in the slow cooker on low for 6-8 hours. If it’s not as tender as you want, it needs more time (full recipe below). 3. Dice 1 cup celery for soup, and cut the rest into sticks for snacking (or save it for another recipe). 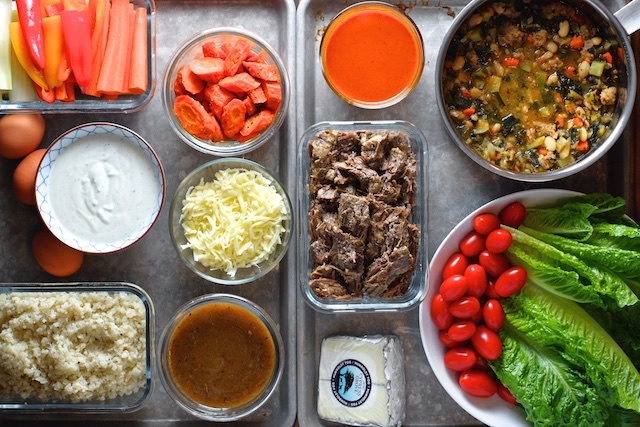 Dice zucchini for soup, slice peppers for snacks (and burrito bowls), grate cheese for burrito bowls and slice the rest for snacks, then mince your garlic for your soup. 4. Make your soup (recipe below). 5. Boil eggs (for snacks/snack dinner). 6. Make rice or saute your cauliflower rice or drain and rinse your black beans. 7. Cool everything down, pack everything up, and put it in the fridge. Saturday: So for me, breakfast for dinner means eggs. Depending on how healthy I want to be I’ll saute veggies and spinach to go with them or follow my heart to hash browns. 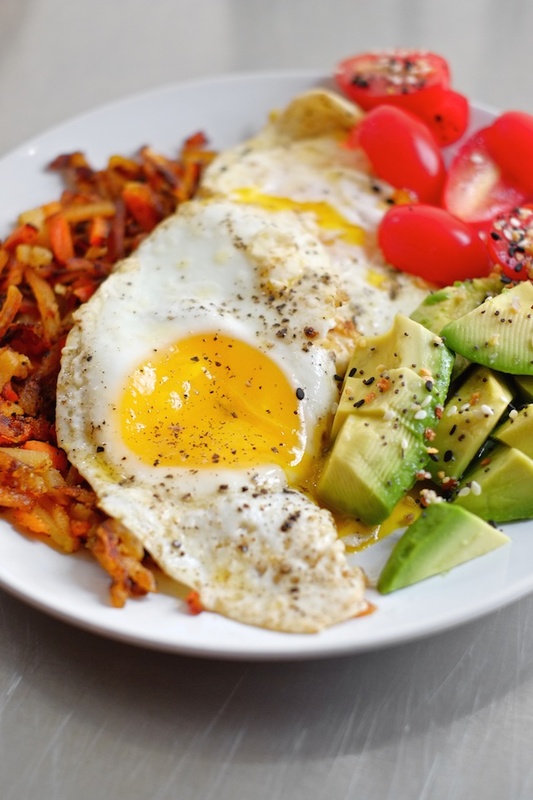 These hashbrowns above were a blend of yukon gold, sweet potato, and carrots from my local grocery’s freezer section. No prep is required for this one – it cooks quickly and the mess should be pretty minimal. If you want to add sausage (me too) or make pancakes instead, do it! But adjust your grocery list first. Sunday: Reheat your roast and veggies, whip up a side salad by tearing lettuce with your actual hands. 2. Season your roast liberally on all sides with salt and pepper and sear it in your instant pot or in a pan. 3. Nestle your seared roast in the bottom of your instant pot or crock pot and pile in the onions, carrots, and potatoes. 4. Cook in the instant pot on high pressure for one hour with natural release. If you are using a slow cooker, cook for 6-8 hours on low or until desired tenderness is achieved. Not tender enough? Add more time. 5. Remove potatoes, carrots, and roast to a serving dish. 6. Make gravy from the drippings left in the pan with a cornstarch slurry. To make the slurry, combine the cornstarch with 2-3 Tbsp of cold water in a jar. Set your instant pot to “saute”, shake the slurry well and pour into the leftover juices from the roast to make gravy. 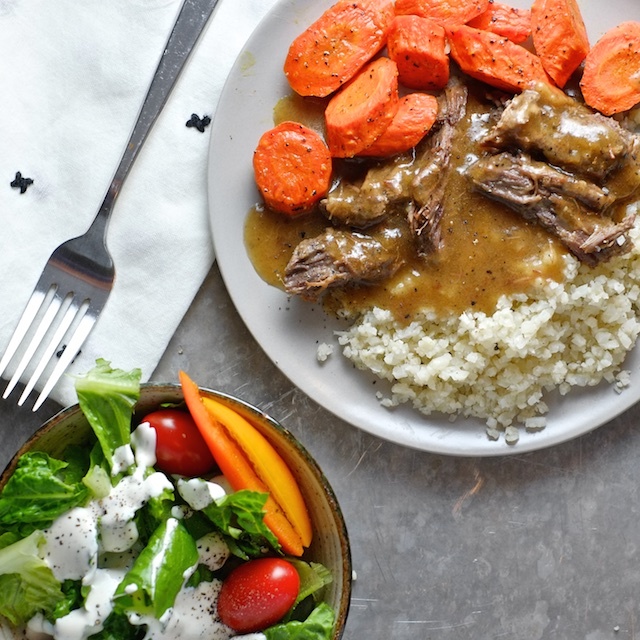 If you are using a slow cooker that doesn’t have a saute function, you can transfer the drippings to a pan and turn the pan to medium heat before adding the slurry, or you can just serve the roast with drippings instead of gravy (no biggie). 7. RESERVE enough roast for burrito bowls tomorrow. 8. Serve the remaining roast with carrots, potatoes (or rice prepped earlier if that’s what you are doing), and a side salad. 1. Reheat your leftover roast IN your red enchilada sauce (pour it on top first). Using a pan on the stove or a dish in the oven would be preferable here, but the microwave is fine. 2. 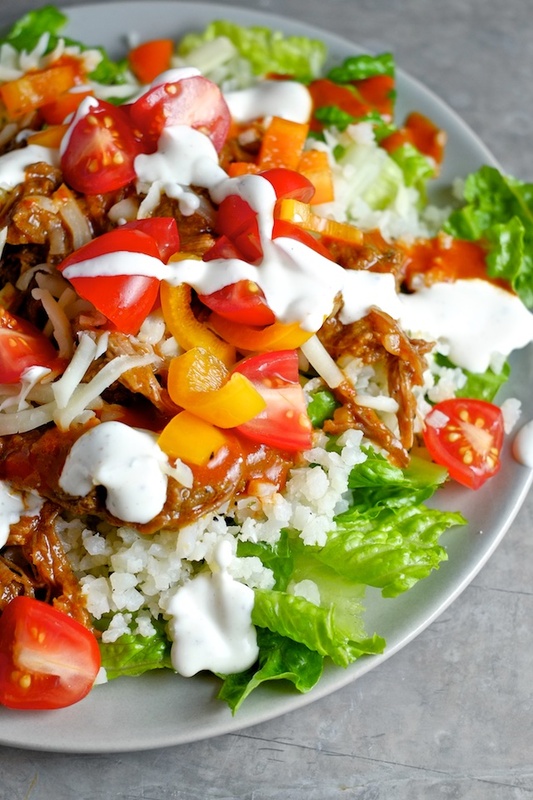 Tear up some lettuce and top it with rice or beans, beef, shredded cheese, tomatoes, sliced peppers, and ranch. It’s basic but it ticks all the mandatory flavor boxes IMO. 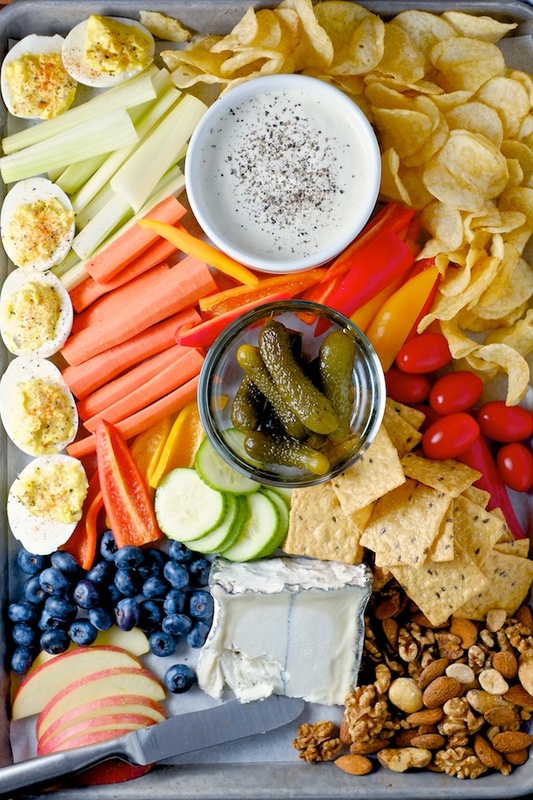 The spirit of snack dinner is to pick one or two things in advance, like a dip and a fancy cheese, or some meatballs or charcuterie, and just put out everything else you find in your fridge and pantry that could possibly qualify as a snack. This tray above is pre-meditated if casual, but yours doesn’t have to be at all. Everything looks better when it’s laid out together on a tray like this, and that jar of olives that’s been sitting in your fridge for a year can finally find a purpose. If you followed all the prep instructions I laid out, you might have some fancy cheese, some casual cheese (lol), hard boiled eggs, celery, carrot sticks, and bell peppers to play with. I am usually surprised by how abundant my snack situation is when I really start looking. Maybe I’m weird in that regard but I have a feeling I’m not. Think outside the box: popcorn, leftover quesadilla, steamed broccoli revived with a shower of olive oil and parmesan (put toothpicks in them and it’s an appetizer). Clean out your fridge! 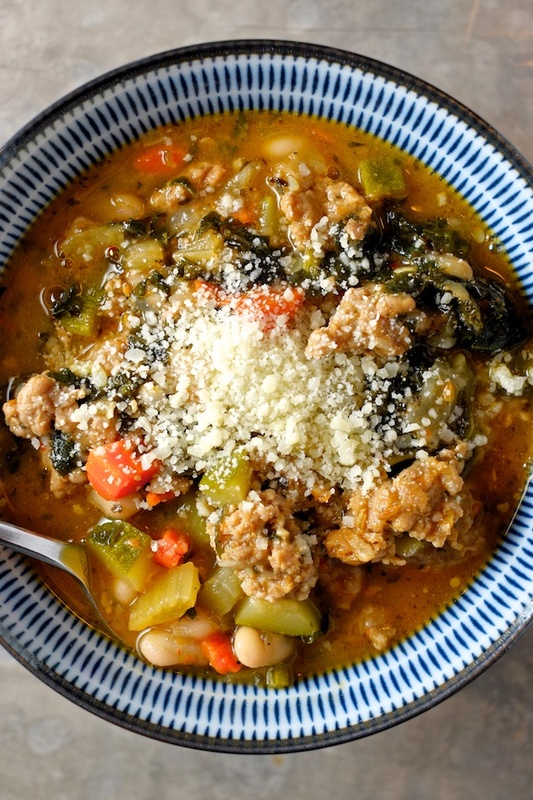 Wednesday: This soup is like a cross between Zuppa Toscana and Minestrone. Like slow-carb (beans are the only carb) minestrone without the tomatoes, or Zuppa Toscana without the cream and potatoes. Anyway it’s delicious, hearty, and kind of actually pretty healthy. What the hell should I call it? 1. Saute carrots, onions, and celery in olive oil over medium heat until soft and lightly caramelized. 2. Add italian sausage and break up with a spoon while browning. 3. Add white wine or vinegar, if using wine cook it down by half. 4. Add chicken broth, garlic, zucchini, kale, white beans, and italian seasoning (optional: red pepper flakes). Simmer for 10-15 minutes. 5. Add salt and pepper, taste, add more. 6. Serve with parmesan cheese, maybe a side salad and some bread.